Many roofing options are available today that homeowners getting their roofs replaced for the first time may find the selection process and consulting with roofing companies overwhelming. 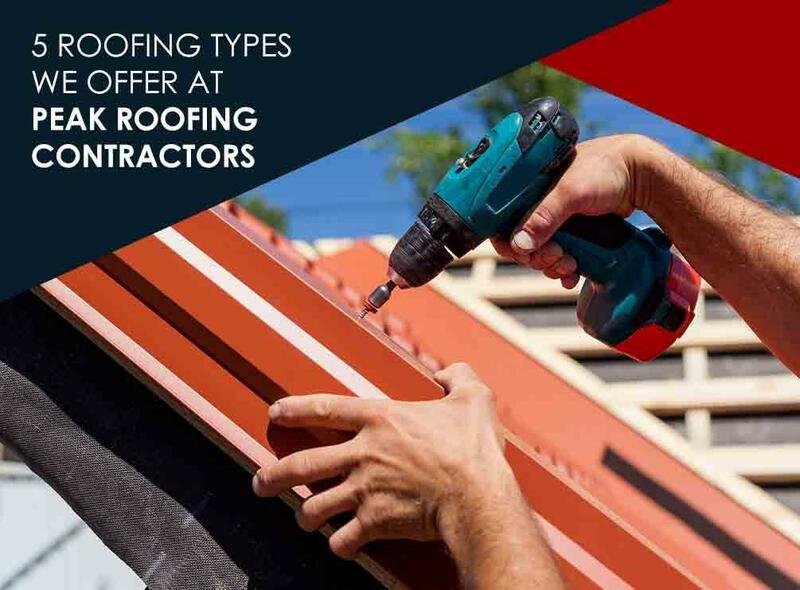 At Peak Roofing Contractors, we know how that feels, so we’ve prepared this handy guide to the roofing materials that we offer. Asphalt shingles – Asphalt shingles are the most common roofing material in North America, still favored by many homeowners for striking a good balance of price, durability, and longevity. Asphalt shingles can be manufactured to mimic other materials such as wood shakes, tiles, and slate. Certain products like GAF’s Timberline® Cool® series and CertainTeed’s Landmark Solaris™ even have cool roof features that bounce heat from the sun (much like wearing light colored clothing during sunny days), reducing the heat absorbed through the roof. In addition to GAF and Certainteed, we also offer roofing systems manufactured by Owens Corning and Tamko. Metal – Today’s metal roofing is leaps and bounds beyond the corrugated tin roofs traditionally used on sheds and barns, even becoming a great alternative to asphalt shingles. Apart from being naturally fireproof and impact-resistant, it’s also lighter than most roofing materials. It can be installed on an existing roof deck without additional reinforcement with an expected life span of 50 years or more. Wood shakes – If your home’s architectural style calls for wood or if you simply want a traditional look for your home, choose wood shakes. Our cedar shakes are specially treated to resist rot and insects, is naturally insulative, and can last up to 35 years. Tile – For roofing that can withstand impact from hailstones and large branches, choose tile roofing. Our options include concrete and ceramic, both proven to be extremely durable, and can last for over 50 years with minimal care. Note that tile roofing is heavier than asphalt shingles and sheet metal, and some roof decks may require additional supports before tile can be installed. Slate – Quarried slate is, without a doubt, a true lifetime investment. Some slate roofs last for a hundred years or more and can resist anything nature throws at it. Plus, slate roofing is easily repaired; the damaged pieces can be removed individually without touching the rest of the roof. Our expert consultants can help you choose the right roofing that will fit your home’s requirements, your taste, and your budget. To know more about our roofing options and services, call us today at (703) 745-5153 or fill out our contact form for your free, no-pressure written estimate. Peak Roofing Contractors, Inc. serves Manassas and nearby areas in Northern Virginia.